I just booked a room in a B&B near Shepherds Bush Empire (Grantly Hotel - no, it's not a joke, Grant! i21.photobucket.com/albums/b294/hdjoespics/EEjdKsU.gif). Now, I only need the most important thing...my concert ticket! Richard posted the following message in the thread "Website updated finally". Although I'm not keen on the venue, I'll definitely be going to see Hayley, and Stephany etc. Not keen on the venue? How is that, Richard - do you mean it's too big? Or the sound doesn't come out neatly enough? in option..Flight and hotel to London from 29 august,till 2 september....and my husband is going with me. I hope the tickets will be soon available...because i have to confirm in five days.Greetzz JOYCE. I also have my train tickets and accomodation in option so I seriously hope the concert tickets will be available soon because I have to confirm everything at the end of the week. According to Roger, Bedlam Management confirmed the event so I don't see why the concert won't happen! I look forward to meeting you and your husband. that's the same for me.... but beware...last year i booked everything for Cologne...and in the last week it was cancelled. But a 4 day stay in London would be great too....but will be better to see Hayley singing.I hope tickets will be soon available. Maybe someone can look for GROUPtickets, or something like that.Greetz JOYCE. I've not been to the Shepherds Bush venue myself and so I can't really comment properly, but I know people that have. I get the impression that its quite an old and large venue, not very intimate shall we say. I'm sure Richard will fill us in on his views when he next logs in and I certainly don't want to put you off. Thanks for the information but you won't pull me out that easily! After reading Richard's post, I was (a little) worried and searched for pictures of the venue. You probably "experienced" the first one...let's hope they will not remove the seats for Hayley! Mark, your answer was really reassuring as well. Let me know when you have your seats - it will be great to have full rows of HWI members and I will feel very secure, haha. Joyce, I hope there won't be any cancellation this time! FINGERS CROSSED....is that correct??? JOYCE. Thanks for finding these pictures Stephany. It actually looks much more "intimate" than I thought. I feel better about it myself now . We just need to get hold of our tickets ! Mark - will you come with your daughter & wife? Sophie looked fabulous at Telford and I also look forward to meeting her as she seems very nice. Are you actually dragging her or is she pleased to come and see Hayley? preparing dinner....and it smells like something is going wrong........!?!?!? Joyce, don't burn out your kitchen because of us! 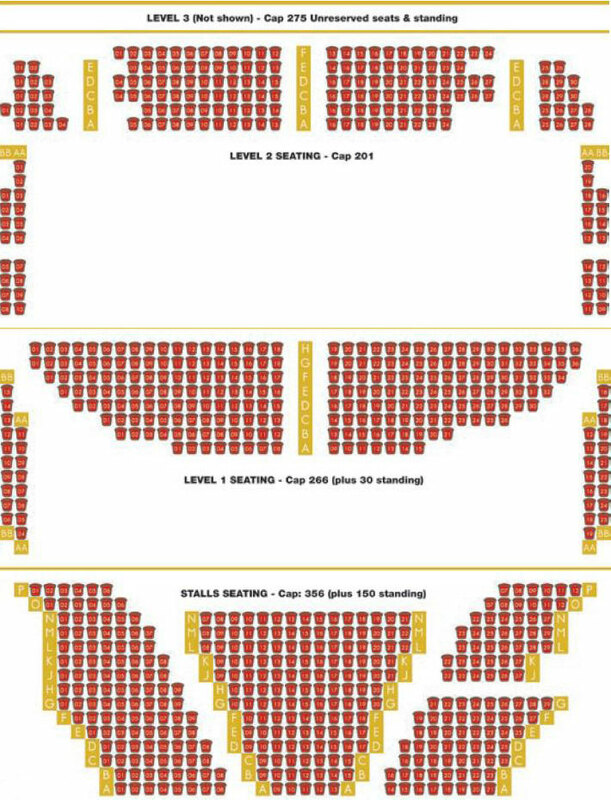 Here is the seating plan of Shepherds Bush by the way. Stalls seats are usually better, right? I'm not sure at this stage if Sophie will want to come with me. I certainly don't have to "drag" her along to see Hayley, she loves her voice and music. However, I wouldn't say she was a dedicated fan (like me) and so she will come to the odd performance if it fits, in terms of travelling, school and her other activities i21.photobucket.com/albums/b294/hdjoespics/EEjdKsU.gif. Apart from this, I guess my family has to listen to me talking about Hayley quite a lot and I think they are suffering "Hayley overload" i21.photobucket.com/albums/b294/hdjoespics/EEjdKsU.gif Particularly at the moment, as I've been to a number of concerts in a short space of time ! !